For you, for your home. 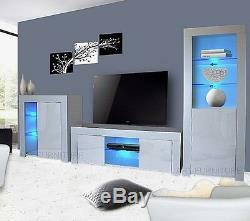 Modern Gloss Living Room Furniture Set TV Unit Cabinet Stand Cupboard Led Lights. This contemporary and stylish living room set is an ideal choice for living room furniture. Featuring a large stand top and a middle glass shelf with LED lighting. Other aspects include a matt finish and two roomy cabinets with one surface each and high gloss push to open doors for more storage space. It will support a TV up to 55. Featuring a large stand top and an open space with two LED glass shelves. Other aspects include a matt finish and a cupboard with a single shelf and high gloss'push to open door. The unit features a matt finish and comes with a cupboard with a single shelf and high gloss'push to open door. This door can be assembled to open either to the left or the right. Another attribute is a large space with two LED glass shelves. The combined length of the set is 267cm. The set is designed and manufactured in Europe using materials that comply with EU rules and regulations. The units are composed of MDF/Chipboard that is 18 mm thick. Please note that this is a flat pack piece of furniture and will require assembling. Full picture instructions are included with the product. For those not expereinced with the assembly of flat pack furniture we recommend employing another experienced individual. The RGB set includes a remote controller allowing you to change colours, this is the best set that we offer, however due to the length of the LED cables, each component of the furniture set will need to stand next to each other, as in the picture. Due to the nature of the glass shelves, white LED lights will cause a green hue. PLEASE TAKE A LOOK AT OUR OTHER ITEMS. Please therefore make efforts to check the item prior to assembly. If the item is disliked, then this also has to be reported prior to assembly. Any product you return must be in the original condition you received it, including its internal protective packaging. Therefore we recommend that you check the item for any damage prior to assembly. Please note that some items are composed of multiple packages and sometimes delays will occur where the packages become separated during transport especially due to larger distances. It features three sections; TV unit Featuring a large stand top and a middle glass shelf with LED lighting. Dimensions: Length- 130 cm Depth- 35 cm Height- 45 cm Small cabinet Featuring a large stand top and an open space with two LED glass shelves. Other aspects include a matt finish and a cupboard with a single shelf and high gloss'push to open’ door. Dimensions: Length- 75 cm Depth- 35 cm Height- 83 cm Large cabinet The unit features a matt finish and comes with a cupboard with a single shelf and high gloss'push to open’ door. Dimensions: Height- 160cm Width- 62cm Depth- 35cm The combined length of the set is 267cm. The item "Modern Matt White Gloss Living Room Furniture TV Unit Display Cabinet Led Lights" is in sale since Thursday, July 20, 2017. This item is in the category "Home, Furniture & DIY\Furniture\TV & Entertainment Stands". The seller is "art-furniture" and is located in LETCHWORTH GARDEN CITY. This item can be shipped to United Kingdom.